Board your flight from Ahmedabad and arrive Cochin. 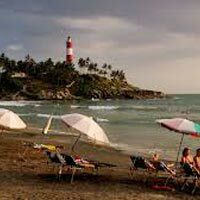 On arrival, you will meet representative who will transfer you to your hotel in Cochin. On reaching, check-in to your hotel, unpack and relax. You may explore the local markets on MG road or enjoy some local Keralan cuisine (on your own). After early breakfast, check-out of the hotel and proceed for a half day sightseeing tour of Fort Kochi. Also visit Dutch Palace, Jewish Synagogue and St. Francis Church and Chinese fishing nets. Later in the afternoon, proceed for Munnar. On the way to Munnar, halt at some good restaurant where lunch will be served. Check-in to your hotel in the evening, unpack and relax. Spend some time in the local markets for shopping and enjoy the evening at your own leisure. Return to your hotel for dinner and a comfortable overnight stay. After breakfast at the hotel, take a sightseeing tour of Munnar. Munnar is famous for its tea plantations. Visit the beautiful serenity of the tea plantations (remains closed on Mondays). Also visit Eravikulam National Park and explore its rich flora and fauna (Eravikulam National Park is shut from 15 Jan to 15 Mar; during these dates Park visit cannot be done but all other sightseeing shall be provided as per itinerary). Relish the local food at a good restaurant. Later in the afternoon, visit Mattupetty Lake and Dam. Enjoy the echo phenomenon at the famous Echo Point. Return to your hotel and enjoy the rest of the evening at your own leisure. Have a warm, hearty dinner and enjoy a comfortable overnight stay in your room. After an early breakfast, check-out from the hotel at Thekkady. Explore the Spice Plantation (which will last for an hour). Later, you may indulge into some spice shopping (on direct payment basis). Drive to Alleppey and reach there by afternoon. On arrival, check-in at the hotel, unpack and relax. Later in the evening, go for an evening boat cruise on the backwaters for an hour. Return to the hotel. You can opt for a traditional Ayurveda massage. Relish a warm dinner and enjoy a comfortable overnight stay in your room. After breakfast, check-out from the hotel at Alleppey and drive to Kovalam. On reaching Trivandrum, halt for lunch at a good restaurant. Later visit Napier Museum and Zoological Park and walk through the lush green zoo for a memorable experience. (the zoo remains closed on Mondays). On arrival, check-in at your hotel and relax. Enjoy a comfortable overnight stay at the hotel after a hearty dinner. After breakfast, proceed to Kanyakumari (approximately 87 kilometres). Visit Kumari Amman Temple, Vivekananda Rock Memorial and Gandhi Mandapam Also witness the beautiful statue of Tiruvalluvar and the meeting point of Indian Ocean, Bay of Bengal and Arabian Sea. 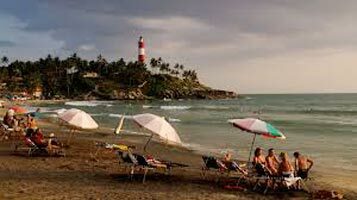 Return to Kovalam by evening. Later in the evening, proceed to Kovalam. Return to your hotel and spend time at your own leisure. Enjoy a hearty meal and retire for the night comfortably. After an early breakfast, check-out from the hotel at Kovalam. Get dropped at the airport for your return journey to Ahmedabad.